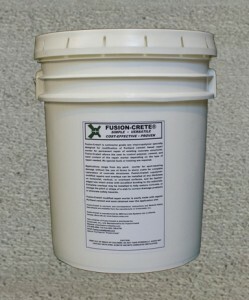 Use Fusion-Crete to resurface spalling, which is damage to the surface of sound concrete. Click photo for solution. Damaged curbs can be restored without forms using Fusion-Crete modified mortar. Click photo for solution. Apply a non-slip Fusion-Crete modified overlay to correct a trip hazard or drainage issue. Click photo for solution. Fusion-Crete modified mortar repairs broken concrete steps or resurfaces damaged concrete stairs. . Click photo for solution. Renew the appearance of an ugly driveway with Fusion-Crete. Click photo for solution. Restore the profile of damaged or rotten retaining walls with Fusion-Crete. Click photo for solution. Fusion-Crete repairs damaged storm drain inlets without forms. Click photo for solution. Damage to a bridge pedestrian walkway seems impossible to resolve without replacement. Click photo for solution. Fusion-Crete® is a contactor-grade vinyl copolymer concrete repair product specially designed to make concrete repair mortar with common Portland cement and sand mixtures. Fusion-Crete is one of the most economical and effective concrete repair products on the market and is unmatched in versatility, durability, and cost-effectiveness. Fusion-Crete of U.S. is the authorized distributor of Fusion-Crete Concrete Repair Product for the entire United States and has maintained an 18 year long successful concrete repair case history. Many of these repairs and restorations were made to concrete subjects in Steamboat Springs, Colorado at 6700 feet above sea level where temperature extremes happen throughout the year and freeze-thaw cycles occur on a daily basis during winter. Because of snow removal by fixed blade equipment and extensive use of chloride based ice melting agents this area is a proving ground for concrete repair products– and Fusion-Crete has proven itself. Fusion-Crete is a product that will resolve many common problems with concrete: spalling, rot, trip hazards, divots, defects, voids, graffiti, drainage issues, needed surface reshaping, etc. Fusion-Crete of U.S. takes pride in our concrete repair product and in the technical expertise we provide to every customer using Fusion-Crete. Although no special training is needed for anyone familiar with basic concrete finishing, we provide damage evaluation, repair recommendations, and material estimating. We are positive you won’t find a more versatile or economical solution for damaged concrete. We look forward to speaking with you and helping to resolve your concrete issues. Contact us now for more information about our Fusion-Crete Concrete Repair Product and let us help you solve your concrete problems quickly and economically!